Epiphyseal fracture of the superior extremity of the humerus. Journal : Buffalo medical and surgical journal ; vol. xxviii. Buffalo : Buffalo Medical Journal Association, 1888-89. Description : 431-439 p., [2 l.] pl. ; ill.: 1 phot., lithos. ; 24 cm. Photograph : photoengraving of the clinical subject on printed leaf. Subject : Humerus — Epiphyseal fracture. Author caption: By Edward M. Moore, M. D., Rochester, N. Y. Medical degree, University of Pennsylvania, 1838. Resident physician, Blockley Hospital, and Frankford Lunatic Asylum, 1838-40. Chair of surgery, medical school of Woodstock, Vermont, 1842-53. Chair of surgery, Berkshire Medical College, 1853-54. Professor of surgery, Starling Medical College, 1854-55. Professor of surgery, Buffalo Medical College, 1858-83. President of the New York State Medical Society. President, American Surgical Association, 1888. Founding president of the State Board of Health of New York, 1889-90. Chief surgeon, St. Mary's Hospital, Rochester. 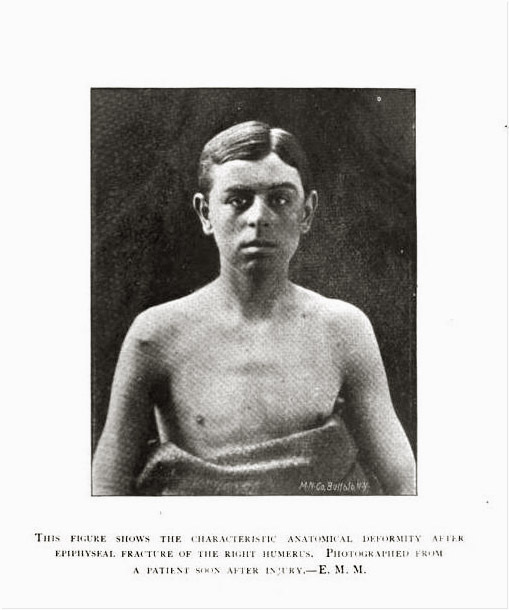 Inscribed in negative: M. N. Co. Buffalo, N.Y.
Photo caption: This figure shows the characteristic anatomical deformity after epiphyseal fracture of the right humerus. Photographed from a patient soon after injury.—E. M. M.
Reissue of a paper read before the American Surgical Association in 1874 and published in the society's journal for that year. Moore was a scholar and surgeon, a specialist in orthopedics, and one of the bearded lions of Rochester, New York, where he acquired the appellative, "Father of the Rochester Park System." In appreciation of his service to the parks department, the mayor commissioned a bronze statue designed in part by Lawrence G. White of McKim, Mead & White.